The team after its national win on Sunday. 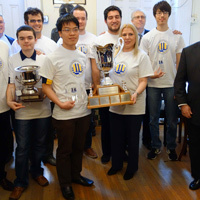 ST. LOUIS - Webster University’s chess team won its fourth consecutive national championship this weekend during the 2016 President’s Cup Collegiate Chess tournament. The win was also the sixth consecutive for Coach Susan Polgar and her SPICE program. Webster University is only the second university in the history of the President’s Cup (also known as the Final Four Tournament) to win four consecutive championships. The players were accompanied with Polgar, Coach Paul Truong, and team assistants Manuel Leon Hoyos, Denes Boros, Ashwin Jayaram, Eric Rosen, Irene Sukandar and Katerina Nemcova. The team scored 8.5 points during three rounds of chess played on Saturday and Sunday in New York City. In chess, each player earns 1 point for a win, one-half point for a draw and zero points for a loss. University of Texas Rio Grande Valley came in second with 7.5 points, Texas Tech was third with 5.5 points and Columbia University was fourth with 2.5 points. The only other team to win four consecutive President’s Cup tournaments is University of Maryland, Baltimore County, which won 2003 - 2006.